Clean your toilet bowl continuously for up to 3 months! 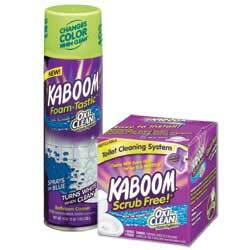 The new Kaboom® Scrub Free! is an automatic toilet cleaning system that is so easy to useâ€”no need to fish around toilet tanks or get out a set of tools just to clean the toilet. Because it is added to the toilet bowl during the refill cycle^ Kaboom Scrub Free! is more effective^ with 100% of the product ending up in the bowl where it is needed.